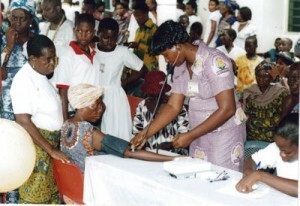 The first Annual Atorkor Health Fair took place on 5th May 2009. An early morning torrential rainfall meant an almost 3-hour delay to the start of the Fair but this did not stop 800 people from attending. 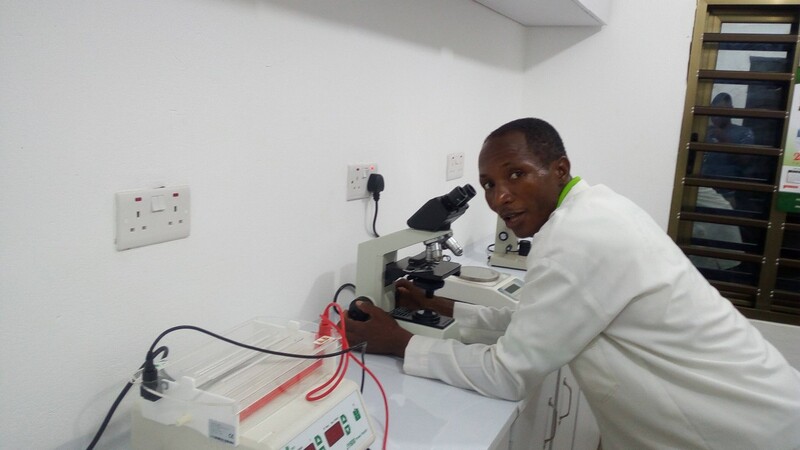 The Minister for health sent one of his deputies and the local Member of Parliament for the area attended. The national media (Radio and TV) covered the program. The Minister’s Rep. said the Fair was unique and it was the first of its kind in the country as it involved and indeed put the community at the heart of it. Other Fairs tend to just talk at the people. HIV/AIDS: 135 people were screened and 1 positive case was diagnosed but according to the head of the stall he/she is not from the area. 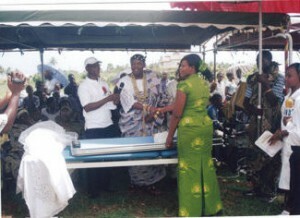 Malaria: 200 hundred treated mosquito nets were sold at a very subsidized price. Mother and child: The ADF subsidised the cost of wean mix, a highly nutrient rich locally formulated supplementary feed for babies. 125 nursing mothers took advantage of the low cost to buy the feed. 175 folders provided by Susan, the nurse from New York were given to the mothers to keep their family medical records secure, especially immunisation records. Oral Health: 110 adults and children were screened. The dental needs of the community are great. There were several cases of rampant caries/tooth decay and gum disease. Free tooth brushes and toothpaste were given to all those screened. The following medical equipment-examination couch, 4 fold ward screen, foetal stethoscope and Doppler were presented to the medical centre. This means the centre can start providing antenatal services to the pregnant women in the community.